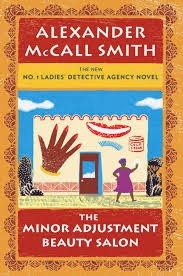 It's always a very happy day when there is a new adventure featuring Mma Ramotswe and her able assistant Mma Makutsi. The Minor Adjustment Beauty Salon is the latest installment in the series concerning the events at the No. 1 Ladies' Detective Agency in Gaborone, Botswana. While the office of the agency still shares the building with the Speedy Motors Garage (run by Mma Ramotswe's husband, Mr. J.L.B. Matekoni), lots of new developments have occurred. Mma Makutsi and Phuti Radiphuti have become parents, Mr. J.L.B. Matekoni decides to become a "modern husband," and Charlie the apprentice reveals a new side of his personality. But even with all these new and exciting developments, there are still cases to be solved. The main case this time involves an inheritance matter. Mma Sheba, a lawyer, is attempting to fulfill the bequests in a will left by a local farmer who has recently "become late." The man left his farm to his nephew, who used to come from a neighboring country to spend the summers with his uncle, but the lawyer is not at all convinced that the young man who has stepped forward to claim the estate is who he says he is. At the same time, the owner of the new Minor Adjustment Beauty Salon finds that her business is the subject of unfounded rumors in town which are scaring away potential customers. Since she recently stole away another woman's husband, it would seem to be pretty obvious who the rumor-monger is, but Mma Ramotswe isn't so sure. To add to her difficulties, Mma Makutsi is on maternity leave, and poor Mma Ramotswe feels her absence around the office. There is no one to bounce ideas off of, or to take frequent tea breaks, or to offer loud and unsolicited advice on the matters of clients. Even though Mma Makutsi (she of the unheard of and yet to be equalled 97% exam score from the Botswana Secretarial College) is only an Associate (or is it Assistant?) Detective, Mma Ramotswe learns how valuable she is as an employee and friend once she's no longer in the office on a daily basis. Luckily, Phuti's bossy and opinionated auntie comes for a stay after the baby's birth, so her presence will be an incentive for Mma Makutsi to return to work quickly . . . I was very happy to spend some more time in the lovely country of Botswana with the kindly characters and their perplexing problems. It's always a welcome treat to visit the characters and settings that are so wonderful -- even if it ends all too quickly!